We reserve the right on the shift of prices. Can be used at two computer at once. If you need more than this, please contact us. Download software, register your company, and you are ready to use it. We will notify you in e-mail about the conditions of the payment of purchase-price. Please make sure to read the Licence Contract of software before you start using it. BillSonar Invoice is compatible with system Mac OS X 10.9+. 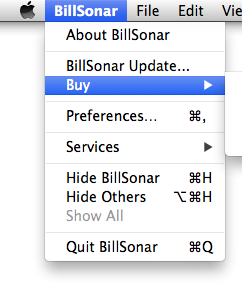 From the menus of software, choose menu "BillSonar/Buy". Basic Invoice Template pack, consisting of 20+1 pieces - 4 separate, in 5 colours by type - can be purchased: $19. If you have purchased from App Store and would like to order the pre-made invoice templates, please write us in email, attaching the company name, TAX number and invoice address of your company. Purchase now and send the promotion code below in email -info@billsonar.com -, and we will give you the 21pc invoice templates as a free gift! Would you like to take a look at the invoice templates? Check out them in the gallery by clicking on tab "Purchasable templates".